The latest caravan, or mobile mob, or organized march is on its way to our southern border. 18 USC 1325. Google it. Read it. Memorize it. This is the section of federal law that makes it a criminal act to attempt to enter, or to enter, without inspection into the USA. Why is it that no one ever brings up this section of law? Why doesn’t the current administration just come out and tell the public that it is a criminal act to violate this law? The left-wing socialist media will never say it. Just the opposite, they avoid it like the plague. Despite clear evidence that these are economic refugees the left-wing socialist media portray the narrative that these are “Asylum Seekers,” “refugees”. Nothing could be further from the truth. The governments of Honduras, Guatemala, Mexico and El Salvador are not systematically persecuting their nationals because of race, religion, political opinion or membership in a particular social group. Organized crime syndicates know the loopholes in our immigration laws and the enforcement of them, and are taking advantage of it. They are for all intent and purposes, smarter than our own legislative branch of government who have been constitutionally charged with overseeing all that is immigration. And have been remise in doing so for years. So once again a moving invasion approaches our southern border. Get in, scream asylum, and go to jail with your children. Even though the vast majority are adult males without children. If the police knew I was about to shoot someone, they would stop me before I did so. We know this mob of economic victims, (victims of corrupt ineffective governments that take US aid and steal from it) are being trained on what to say when and if they reach the US southern border. The Executive Branch is charged with enforcing our federal laws. The left-wing socialist media has boxed our Executive Branch into a damned if you do damned scenario. 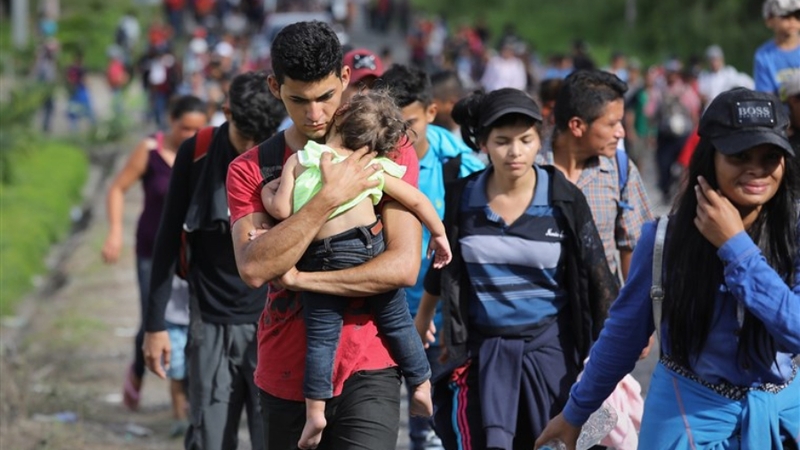 So, do we militarize our southern border or just let the thousands and thousand of poor migrants enter the USA, get a place to eat, sleep, medical care at the expense of us, the US taxpayer?